Free shipping to United States when you buy 2 items from lampshadelady. See item details below for sale terms. The lamp shade measures 6" across the top by 8" across the bottom and 6" high. It clips onto the light bulb. This one is fun as it has the vintage monogram of the owner: SE. Note: The lamp is not included. Convo me if you would like it and I can add it to the order. Please make sure ask questions before you buy; I am more than happy to help you with questions. Lampshade sizing can be tricky but with some help I hope we can make it easier. Please see shipping policy. I have been making shades for over 25 years; please feel free to Convo me with sizing and attachment of shade. 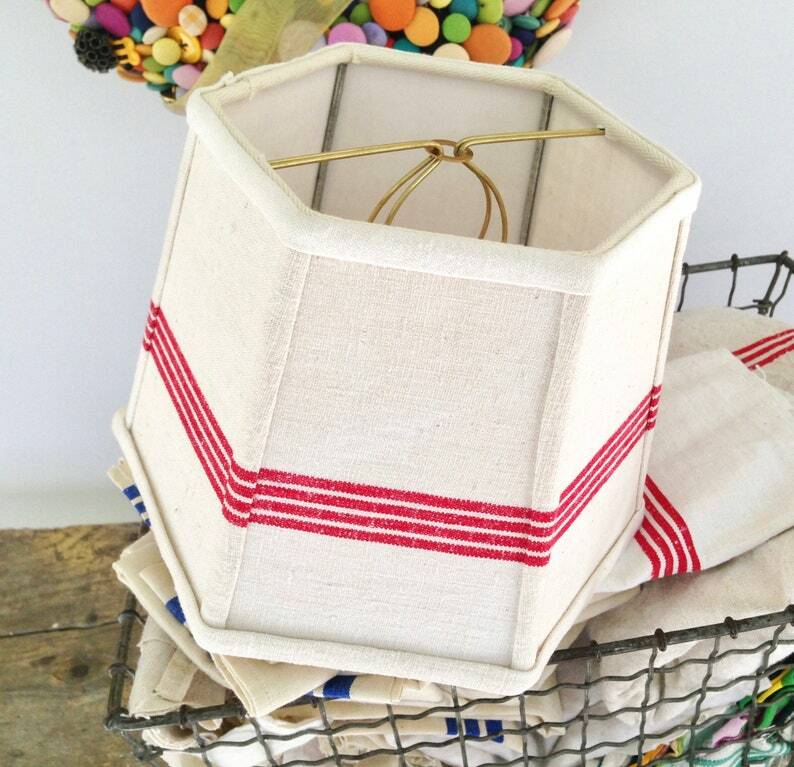 Vintage textiles often have blemishes and slight flaws. If you are out of the US contact me for shipping info. Custom orders are welcome with your fabric or mine! ps. 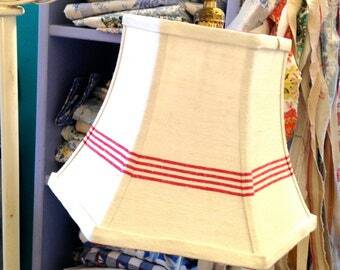 All lampshades are handcrafted in my Southern Vermont shop/studio Lake's Lampshades. Come for a visit if you are in Vermont; a call is suggested: 802-325-6308, usually closed Sunday and Wednesday. 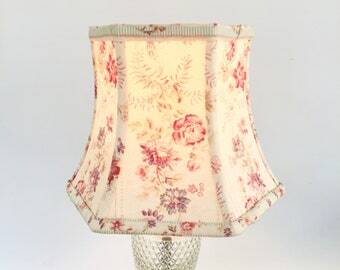 French Lampshade in Vintage Cottage Print, Pink and green Clip top - Sweet! Standard shipping for 2 in-stock lampshades to ship within the US. Absolutely beautiful, as usual. I am addicted to buying lampshades from this shop. 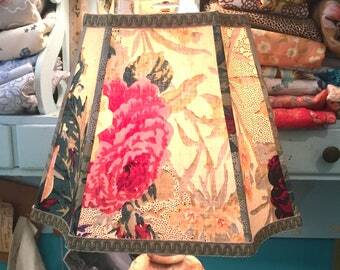 Judy custom made a pair of these beautiful shades for two small lamps I had, using the most fantastic red toile fabric. They are perfect and they look amazing in my dining room. Judy is the absolute best, hands down, of any lamp shade creator in the universe. Her shades are perfect in every way, and so unique and special. You just don’t see lamp shades like hers everywhere. The customer service you receive when shopping with the Lampshade Ladyis outstanding, and the expertise and quality of her shades is unmatched. I will forever be getting my lampshades from Judy! Beautiful shades for my existng sconces, love the grainsack fabric. Thank you! i have been buying judy's shades for 20 years. she is so talented. they are all so unique and made with such love. i must have 10 of her shades in my house. Absolutely the most beautiful lampshade I have ever seen!!! Excellent quality and beautiful!! 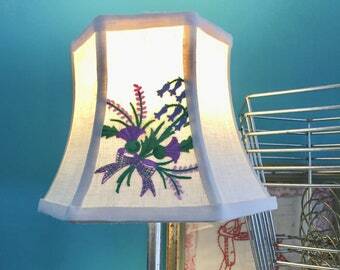 Swedish Embroidery Bridge Lampshade, Uno Lampshade for standing lamp, Threads onto socket - Love this!!! Pricing for the continental USA. Customer is responsible for all custom duties. I always hope customers are completely happy with my lampshades; I am a small business and take great heart in what I create. PLEASE make sure to ASK questions BEFORE you buy. 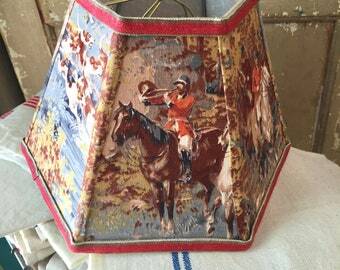 I have been making lampshades for over 25 years and have a vast knowledge of lighting and lampshades. There are many details when ordering lampshades, please read the size and the manner in which the shade clips or screws onto the lamp. No REFUNDS. Please ask me questions before purchasing. Lampshades are not easy to ship and do not often make it back to me in good shape. I will accept returns brought to my shop only. No refunds on shipping for any shades if returned or exchanged. All lampshades are always insured for shade value. If you are outside of The States, please convo me for international shipping. I am just starting to ship my lampshades outside the US. If you do not see your country listed, please contact me for pricing. Please note: Customer is responsible for all custom duties. I always welcome custom work with your own fabrics. Cottons or Linens are best. 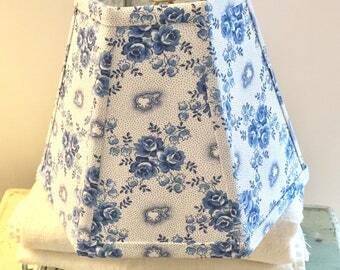 I make HARD BACK lamp shades. Fabric is laminated to pressure sensitive styrene. NOTE: I can not use silk, poly or any slippery fabrics. They do not laminate well.